Hey look, Stuart! It's the stuffed owls and plush owls! Whoooo? 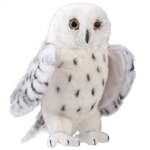 You know, the stuffed snowy owls, plush great horned owls, stuffed barn owls, and plush great grey owls. Oh. Do you have any plush burrowing owls? Well, you won't find one by looking up in the tree. You have to scroll down, Stuart. See? There it is, the Plush Burrowing Owl by Folkmanis. Cool, huh? It's safe to say that we have a stuffed owl or plush owl for any occasion here at Stuffed Safari. Big plush owls, small stuffed owls, plush owl puppets, and even stuffed owls with sound can be found on the following pages. Your next party will be a real hoot with the right mixture of stuffed owl party favors and Good-time Charleys. We can supply the plush owls, you supply the Charleys!